Put the kimchi in a clean J-Cloth or muslin square and squeeze out as much liquid as you can. Chop finely and set aside. For the dough, mix the flour and salt in a mixing bowl, then add the oil/ghee and mix again. Slowly add the warm water a little at a time, kneading well until you have a soft, springy malleable dough (you may not need all the water). Cover the bowl with a clean tea towel and set aside to rest for half an hour. Divide the dough into 8 equal balls, dust with a little extra flour and keep the balls covered with a clean moist cloth or cling film to stop them drying out as you work. Before preparing the parathas, grease your palms with a little of the oil. Flatten one ball in the palm of your hands to form a 12cm disc. Put a generous teaspoon of the chopped kimchi in the middle and bring the edges of dough up like a purse/parcel to seal the kimchi inside. Flatten the top then, using your fingers, flatten the whole thing to form a disc about 15cm wide. When you’re flattening the disc, try to work the filling to the edges so it’s evenly distributed. Prepare the rest of the parathas in the same way. Heat the oven to 140°C/120°C fan/gas 1. Heat a non-stick frying pan to medium-high. Put half a teaspoon of oil/ghee in the pan and fry a paratha for 2 minutes on each side until lightly blistered. Put on a baking tray, cover with foil and keep warm in the oven while you cook the rest. When ready to serve, heat a glug of oil in a medium frying pan, then crack in 2-3 eggs at a time and fry for 2-3 minutes until cooked to your liking. Repeat until you have enough cooked eggs. 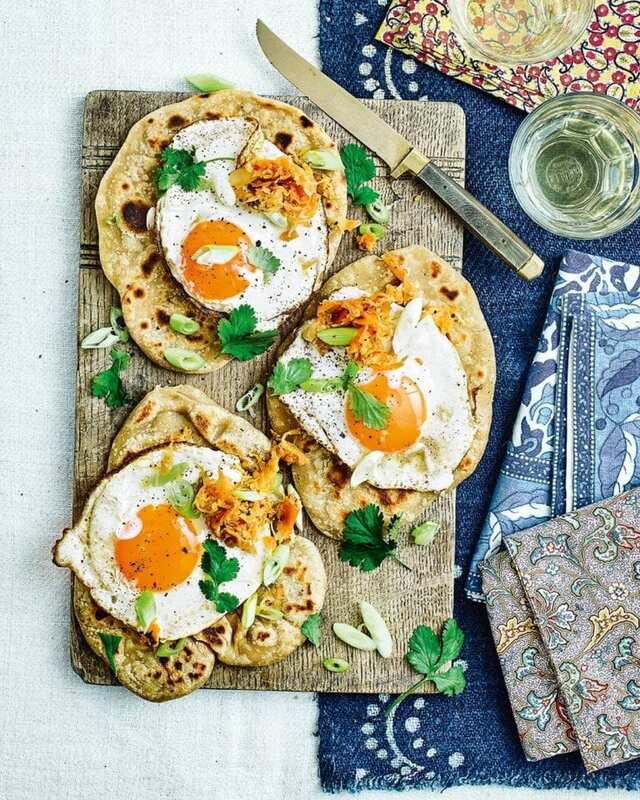 Serve the parathas with fried eggs on top, extra kimchi and scattered with spring onions. We like Kim Kong Kimchi, from Amazon Fresh and Planet Organic (it’s also suitable for vegetarians, unlike most). Or make your own: find a recipe at deliciousmagazine.co.uk. Make the chapati dough up to 12 hours ahead and keep covered in the fridge until ready to roll out and cook, or fry the parathas a few hours ahead, leave to cool, then keep covered somewhere cool and warm in the oven to serve.